In part 3 we sent and received single characters to control LEDs using a fairly simple technique. If all you need is to remotely turn a few things on and off then this method is probably the best. It is simple, easy to program, and reliable. Sometimes though single characters are not enough and we need to use more complex commands or we may want to send sensor data that comprises more than one character. In this post I look at a few different techniques for sending complex data and commands; starting with functions that are built in the Arduino language and moving to our own functions that, IMHO, perform better and allow for better code. A common mistake a lot of beginners make is to test data before you have it. When receiving more than one character via serial, it is easy to assume that all the data arrives at one time. It does not. When a device sends “HELLO” it is sent one character at a time and received one character at a time. The receiving device then has to put all the characters together to form the word “HELLO”. By Arduino standards serial is very slow and the Arduino is capable of performing thousands of tasks in the time it takes to receive all the characters. This means if you are not careful your code can start checking the received data before you have actually received it. Another problem I have seen is thinking a serial.read reads all the available data. It doesn’t. It reads one character or byte only and it is up to you to read all the data and put it together. Let’s start with a simple example of receiving strings from the serial monitor. Here the user types in their name and clicks send. The Arduino does not know the length of the users name so we need a way of determining that we have all the data. A fairly simple method is to use Serial.readBytesUntil(…) this allows us to use a terminating character as a marker. 3 – it times out. In the serial monitor we can choose what EOL characters are added to the input. Here I am using Newline only. This adds a newline (“\n”) to the input and we can use this in the Serial.readBytesUntil(..) function as the terminating character. “\n” has the decimal value of 10. This is very basic and does not include any error trapping. The buffer is set to a maximum length of 30 characters but it is possible for the user to enter more than this. This would probably cause the sketch to misbehave. Give the above a try. It should work quite well as long as you remember the limitations. What happens if you do not at the newline character? Give it a try. Select “No line Ending” in the serial monitor and enter a new name. It still works but there is a delay before the Arduino responds. This is because the Serial.readBytesUntil(..) function is waiting until it times out. The default timeout is 1000ms or 1 second, so the delay should be 1 second. For this example a 1 second delay is not a big deal but it could be a problem if the data is not being transmitted quick enough. The function would time out before receiving all the data. Try entering your name one character at a time. remove the line end character then enter your name one letter at a time, click send for each letter. On the last letter add Newline and click send. The chances are your name will appear in parts. Unless you are very careful with how you implement your code it is likely the Serial.readBytesUntil(..) timeout will cause problems. We could increase the timeout, this would kind of work, but remember the function blocks while waiting. This means the Arduino cannot do anything else. A better way may be to create our own function that collects the serial input, with no timeout, while still doing other things. You should be able to see that on every iteration of the loop serial is checked for data. If there is data a single character/byte is read. The newly read character is checked to see if it is the terminating character. If it is it means we have new data. If not, the character just read is added to the char array called buffer and the process continues. If the last character read is the terminating character then we do something with the new data. You should also be able to see that we are not waiting for data to arrive If there is new data we deal with it. If no new data we continue. This means we can do other things rather than sitting around waiting for all the serial data to arrive. The sketch works but is not really easy to develop. Let’s tidy up the sketch and put the main parts in to their own functions. which makes adding more code a lot easier. Variable index is the index position of the buffer. Where the next character should be copied to. Variable haveNewData is a flag used to tell the rest of the sketch when we have new data. If serial data is available we read one character in to c. We then check to see if c is not the terminating character and if it is not we copy c to the buffer char array at position specified by index. Then index is incremented ready for the next character. If c is the terminating character there is no need to copy it to the buffer we simply close the buffer (add ‘\0′ to the end of the buffer) set index to 0 ready for next time and set haveNewData = true to show we have new data. In the main loop we check to see if haveNewData is set and if it is call the processData() function. As well as handling the new data processData() function also resets haveNewData. Give it a try. It should be exactly the same as before. Why is this better than using Serial.readBytesUntil(…)? As mentioned above, Serial.readBytesUntil(…) has a timeout. This is unlikely to be an issue when using the serial monitor but it becomes an issue when receiving serial data from other devices. Our new method does not have a time limit. It can receive one character a minute, or one character an hour and still work fine. You can test this yourself using the serial monitor. Set the EOL to “No line ending”, enter A click send, enter B, click send, enter C and click send. Now change the EOL back to “Newline”, enter D and click send. “ABCD” should appear in the serial monitor. 1 – It is still possible to receive more data than the buffer can hold. 2 – We do not know if we received the very start of the data. We only know we received the end. There is no 100% satisfactory way around issue #1 while using a buffer. The Arduino does not have the memory to handle very large buffers (we can’t simply keep making the buffer bigger – a bit bigger is OK depending on the size of the rest of the sketch). Although the sketch may not be able to handle large data sets we can at least stop the large data corrupting the Arduino memory. Unfortunately doing so means we can loose data. If you do need to handle large blocks of data you would manage the data as it arrives rather than saving it to a buffer. To limit the size all we need to do is check the current index position against the maximum size of the buffer. If we have reached the end of the buffer do not increase the index. This does mean the end of the data will be missing but at least the sketch is not going to go down in flames. Char array over runs are very difficult and annoying to debug. The Arduino will quite happily try to copy 40 or 50 characters in to a 30 character char array which can cause all sorts of mayhem. The memory directly after the char array is likely used by other variables so when you over run the array size you start over writing other variables. 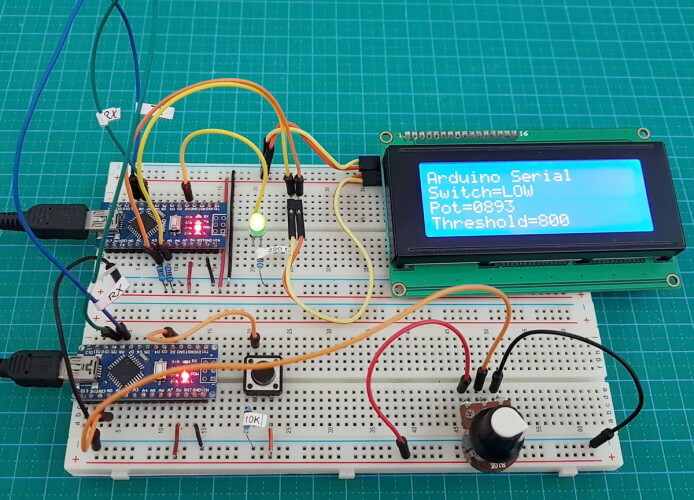 If you allow the Arduino time to get started and ensure that serial has started the above can be fairly reliable. It could be a little more fool prrof and we cannot be 100% sure we have received the start of the data only the end. To address this, the next step is to use a start marker as well as an end marker. Playing with the serial monitor is all well and good but it is not very practical. 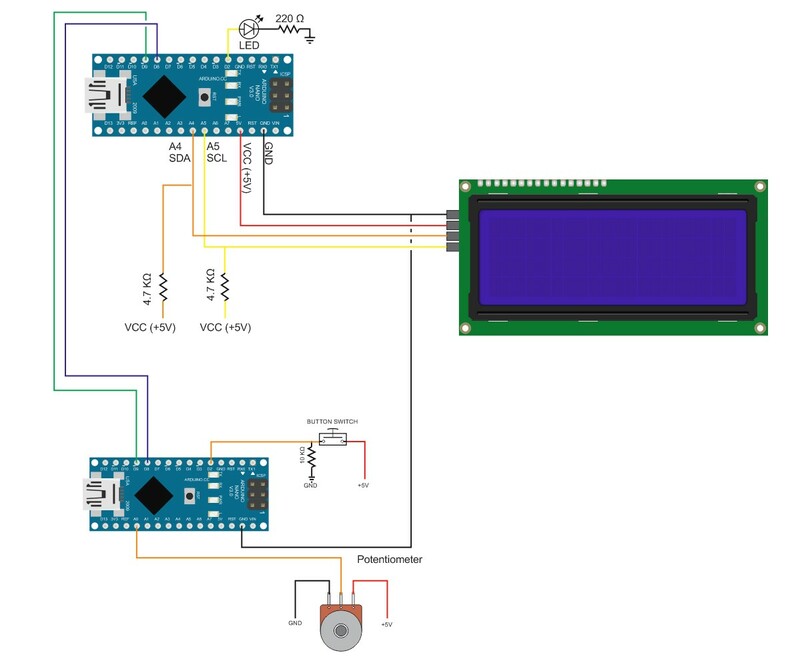 Here is an example of sending a sensor reading to another Arduino that displays the sensor value on an LCD screen. In this example both Arduinos are connected to the same computer. This means their GNDs are connected through the USB connection and I did not need to add on the breadboard. When the Arduinos have separate power supplies the GNDs need to be connected. The following sketches use AltSoftSerial and NewliquidCrystal. The master device has a button switch and a potentiometer. The sketch reads the status of these devices and sends the reading to the slave device using AltSoftSerial. The slave device receives the data and displays it on the LCD screen. The master sketch reads the button switch every loop and when a change is detected it reacts straight away. The sketch reads the potentiometer every half second. Checks to see if the value has changed and only if the value has changed does it send the reading to the slave Arduino. Only sending data if the reading has changed reduces the amount of serial data that needs sending. You can test the master sketch by opening the serial monitor. Everything sent to the AlrSoftSerial connection is copied to the hardware serial. This is good for monitoring and debugging but not actually required. The slave sketch is very similar to the Arduino_Serial_Part_4_004_Serial_input example above. The difference is in the processNewData() function. In the new sketch, if the received data is a switch reading (starts with a “S”) the sketch shows HIGH or LOW on the LCD. If the reading is a pot reading (starts with a “P”), it shows the pot value on the screen. When processing the button switch data, you should see that I do not check the whole command, only the first letter (H and L). This means I do not actually need the whole command and could use “S=H” and “S=L”. I do not use the “=” either so this can be removed and the commands could be “SH” and “SL”. I am not concerned about speed here and “S=HIGH” and “S=LOW” are easier to read when you are reviewing the code but if performance is a priority you should keep the amount of data transmitted as low as possible. Using AltSoftSerial you should be able to increase the baud rate to 38400 bps without any issues. Beyond this you may start to notice problems. It is worth experimenting with higher baud rates to see how far you can take it. An issue worth mentioning is additional EOL characters. The standard Arduino EOL is 2 character “\n” and “\r” and are added to the end of the line in that order. This means if you use the above method and the data has normal EOL charters, the function will leave the “\r” character in the serial buffer which then gets added to the start of the next data. This will cause issues with formatting and converting ascii to values and very likely be difficult to debug. Start and end markers is my preferred method for serial data when speed is not a priority. To make things a little easier on myself I also use ascii for numbers and try to use fixed length data wherever possible. You can see more examples here and here. Start and end markers is not original and is based on (or simply copied) from a post by Robin2 on the Arduino forum. I started using this function a while ago, liked it and have used it ever since. I use square brackets ([ and ]) as start and end markers. The function reads the serial input buffer until it finds a start marker, it then starts to copy data to the buffer called receivedChars. When it finds the end marker it stops copying and sets newData true. Anything not inside the markers is ignored. Upload the following sketch, open the serial monitor and enter something. If you use the start and end markers, what ever is contained in the markers will be displayed in the serial monitor. Anything outside the markers will be ignored. const byte maxDataLength = 30;  // maxDataLength is the maximum length allowed for received data. The data outside of the start and end markers is ignored. The only drawback to this method is that the data cannot contain the start and end markers without using special techniques like control codes. You can off course use any value or character for the markers. and in the slave sketch the recvWithStartEndMarkers() function replaces the readSerial(). Everything else is the same. I mentioned above that one of the benefits of using your own functions rather than those built in to the Arduino core is that with your own functions the Arduino can do other things while still receiving serial data. 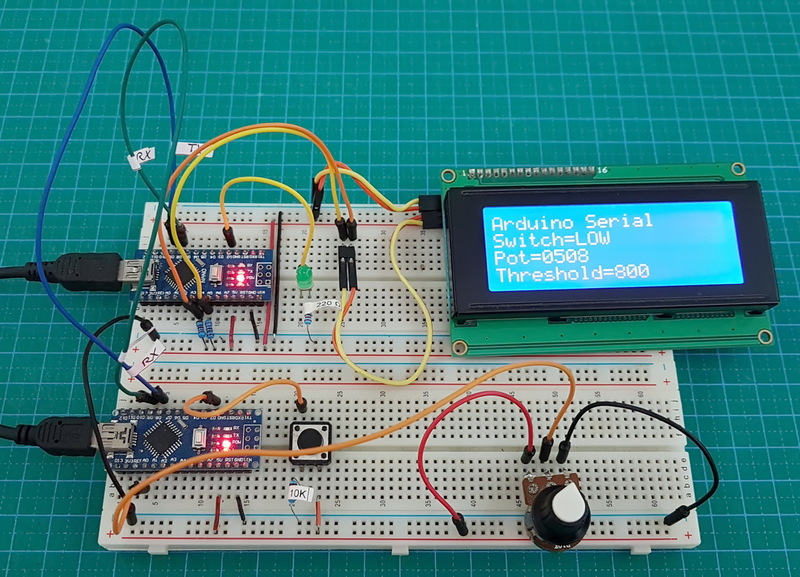 Using the functions from the Arduino core, such as readBytesUntil() block the Arduino. To show how not blocking may be useful, the next example adds a flashing LED. When the pot value goes above a certain level the LED starts to flash. The master sketch remains the same as above. The slave sketch is updated to include the new code (which is very similar to the potentiometer timing check code used in the master sketch). When the pot value is below the threshold the LED is off. When the pot value goes above the threshold the LED starts to flash. A few things to note about the new sketch. I am using the actual numeric value of the pot. This means I have to convert the ascii value to the actial value. I do this using atoi() or ascii to integer. LEDflash is used to show if the LED should be flashing or not. It is possible that the LED is on when the value of the pot goes below the thresold and the flashing stops. To make sure the LED is off when this happens I set LEDpin LOW. You could check LEDstatus if you wished and only set the pin LOW if the LED is on but there isn’t really any reason to. Thanks to using functions, the main loop() if fairly basic, just three lines of code. The flashTheLED() function checks how much time has passed and if the time is greater than the blink rate it switches the LED on or off accordingly. The master sketch is the same as above. If you want to take this one step further try adding a function so that the button switch on thew master device sets the thresold limit. IE set thew pot value to the thresold value you want and click the button switch to set. Of course, you need to send the new thresold value to the slave device. I will leave you to try this. That’s it for this part. Everything so far should give you a decent introduction to serial data and how to implement it in your own projects. Next I look at sending raw data and numeric values. No asscii. 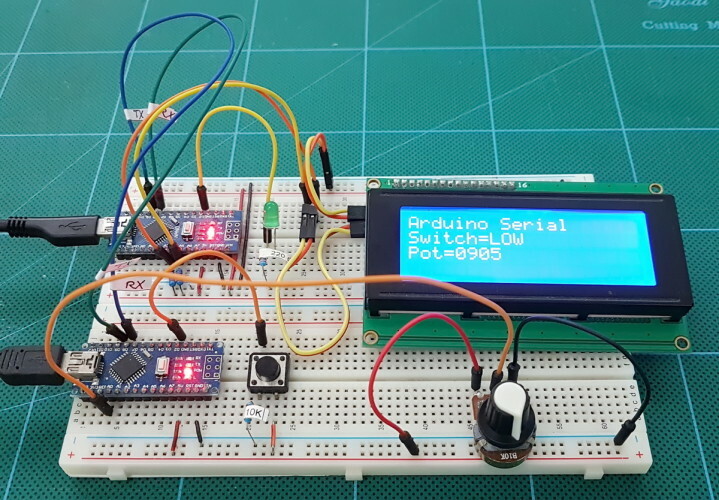 This entry was posted in Arduino, serial by Martyn. Bookmark the permalink.